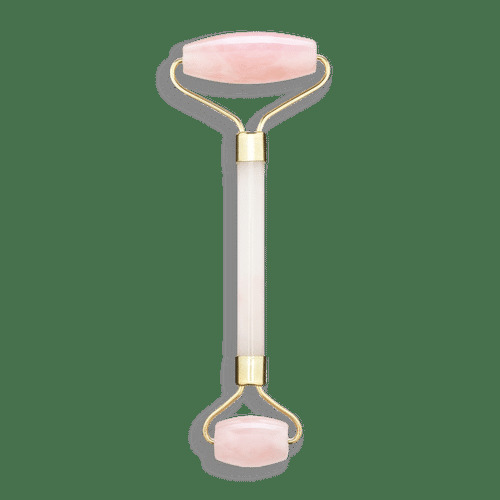 Introducing premium grade rose quartz jade roller that draws inspiration from traditional Chinese medicine. Crafted from pure jade stone, this compact hand-held device boosts collagen production, improves the benefits of serums and flushes out toxins for a smoother-looking complexion. Rose quartz has a long tradition of association with beauty and love in European and Northern African traditions. Considered a stone of love, rose quartz is believed to promote unconditional love, open the heart and create harmony in relationships. It purifies and opens the heart at all levels to attract unconditional love, self-love, friendship, joy, deep inner healing and feelings of peace. Historically, the stone has been used as a love token for as early as 600 B.C. Greeks and Romans believed rose quartz rocks had strong magical powers. The Egyptians also believe the stone could prevent wrinkles and the effects of aging. The act of rolling and massaging the skin with the jade roller increases circulation and helps the lymphatic system to carry away toxins. In exactly the same way that a deep tissue session can leave your body feeling relaxed and refreshed, facial massage helps relax the facial muscles loosening up the spots where wrinkles are born. After a long day of work the Jade Roller facial tool works very relaxing as it feels smooth, cool and comfortable. This jade face roller works best together with your favorite moisturizer or serum. This jade roller is made from 100% Natural Jade so color and transparency may vary. But you can rest assured they all do the same amazing job! Kindly note: Each set differs from color or texture as it is made of natural jade. The roller is handmade and delicate; we recommend using gentle pressure as skin is also delicate. Explore the entire range of Massagers available on Nykaa. Shop more Jade Roller products here.You can browse through the complete world of Jade Roller Massagers .